Product prices and availability are accurate as of 2019-04-14 13:31:43 EDT and are subject to change. Any price and availability information displayed on http://www.amazon.com/ at the time of purchase will apply to the purchase of this product. 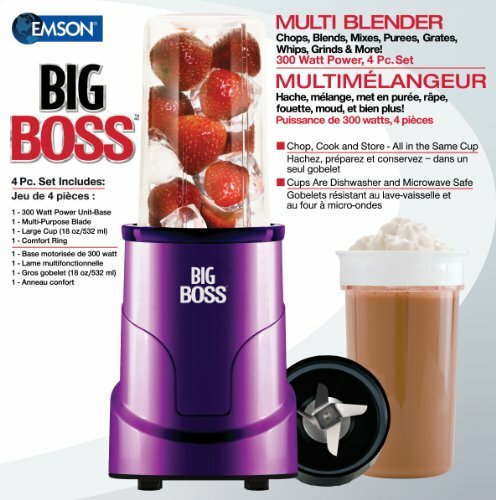 The Big Boss Blender Multi Blender System is a must have for every kitchen. The 4pc. system features 1- 300 Watt Power Unit-Base, 1- Multi-Purpose Blade, 1- Large Cup (18oz./532 mL), 1- Comfort Ring. A design so versatile, it chops vegetable, blends smoothies, grates cheese, grinds coffee, mixes soups, batters, cocktails and so much more. Easy to use; just place ingredients into cup, twist on blade, lock onto the power base and down to start operation. With safety locks on the power base, it prevents accidental spills and messes.